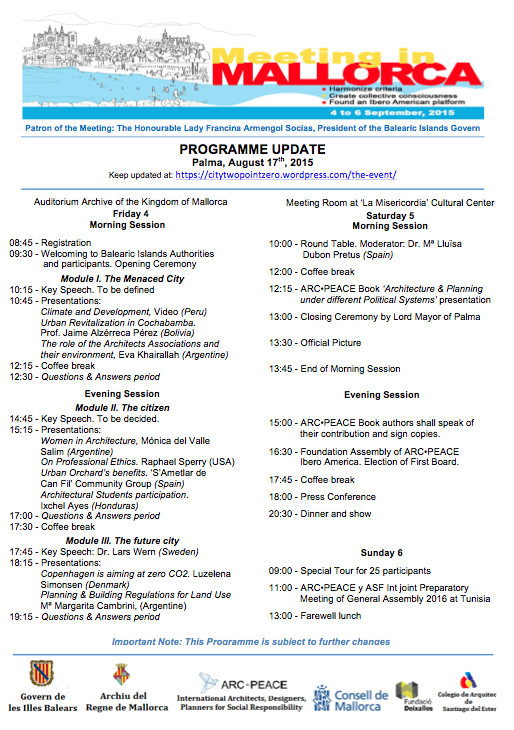 The meeting will be held in Majorca from 4 to 6 September, 2015, as announced on our Facebook page (ARC•PEACE International and ARC•PEACE Ibero America). You can participate by sending your communications based on any of the following topics of your choice. Module I. The threatened city. 1. The structural social injustice. 2. Absence of dynamic planning. 3. Climate change out of control. 4. Landscape predation by abusive tourist approaches. 5. Lack of accessible urban education. 6. Belligerence and urban violence. Module II. The citizen. 1. NGOs. 2. Social networks. 3. Training for active participation: discussions, surveys, seminars, round tables, multimedia presence. 4. Requirement of a common accountability of officials and transparency of governments. 5. Make permanent lobbies for plebiscite unwise government decisions. Module III. The future city. 1. The human right to live without discrimination. 2. Urban development based on cooperation and cultural diversity. 3. Recovery and improvement of both urban and natural landscape. 4. Conversion of military budgets into building peaceful and inclusive urban spaces. Submission of full proposals: 27 July. Digitalized Meeting Briefings to be published for free access: October 2015. Communications should fit into only one of the modular topics, but may cover one or more topics of chosen Module. They shall not exceed 2,000 words, and have up to 6 complementary illustrations. The abstract should be submitted in Castilian and English (400 words). The authors of communications approved by the Scientific Committee will be able to present them live and shall be included in the Meeting Program. Welcome to the blog of the City 2.0 event!